Dimboola. It has a slightly comic sound, but perhaps that’s because we remember the Jack Hibberd play and movie of the same name. It’s not the first place you’d think of for a food festival. Nevertheless, that’s where we went this weekend. It was a four-hour trip from Melbourne – a drive through endless flat wheat fields, now vivid green after generous winter rains. 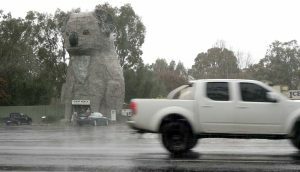 Comic relief was provided in Dadswell, where the Giant Koala loomed over the highway. Like many country towns, Dimboola is cut in half by its railway line and dominated by its silos. Clearly, it’s a wheat town. The buildings lining the wide streets reflect the town’s history. The first store opened here in 1859 and the Dimboola Banner, still in print, was first published in 1879. One of the earliest industries in the region was salt. 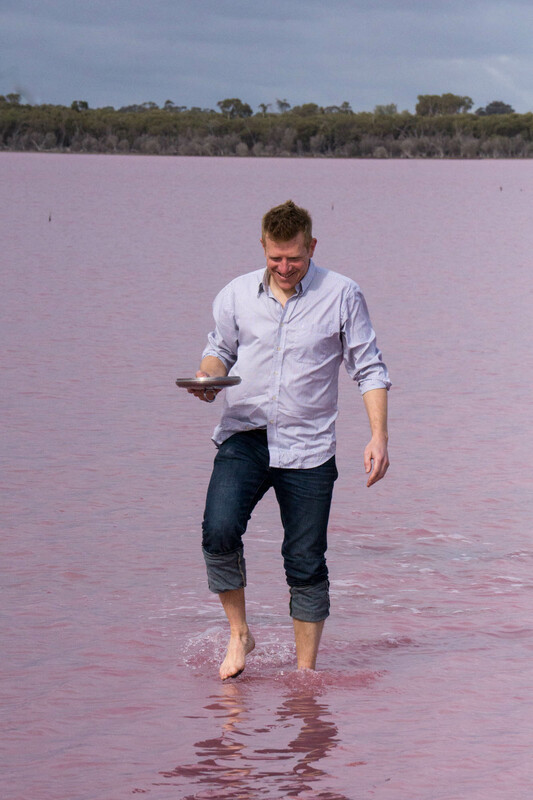 A short drive from Dimboola towards Adelaide takes you to the Pink Lake, where salt harvesting started in the 1860s. As part of the festival we took a tour, guided by Richard Seymour from Mount Zero Olives. Since 2009, Mount Zero have had a license to harvest salt from the lake, in collaboration with the traditional land owners represented by the Barengi Gadjin Land Council. Richard explained that the water in the lake rises naturally from a salt aquifer, the remnants of an ancient ocean. It forms a crust up to 15cm thick which is scraped off, air dried and broken up in a machine like a cement mixer. We saw remnants of the old boilers, brine storage tanks and tramways that were used in the past to harvest hundreds of tons of salt a year, most of which was used for tanning, glazing tiles and pipes or even as a weed killer. The local butchers used it for brining meat. Mount Zero take only around 30 tons a year, scraping an area ‘about the size of three tennis courts’. Harvesting takes place over a short period at the end of summer, when the shallow lake is largely dry. The area covered is marked with posts, so the next year’s harvest will take place in a different spot. 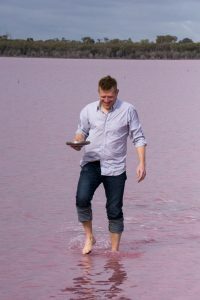 The spectacular pink colour of the lake comes from beta carotene, produced by algae – the only form of life than can survive in this saline environment. Bravely, Richard waded into the chilly water and scraped a panful of salt from the lake bed. 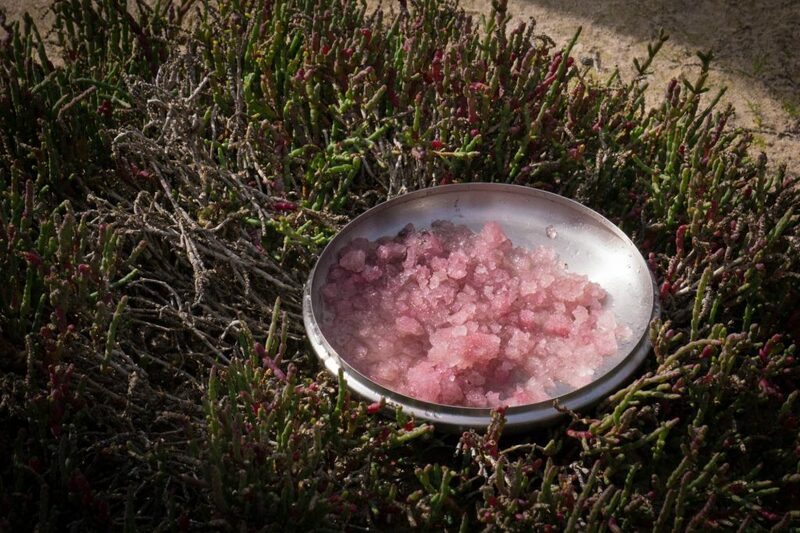 The bright pink crystals had a definite smell and taste of that long-vanished sea. Growing along the lake shore is samphire, a succulent plant that’s also known as sea asparagus, swamp grass, salicorne, glasswort, pickleweed or sea beans. We sampled some, fresh from the bush. It pops in your mouth and has a pleasant, salty taste. 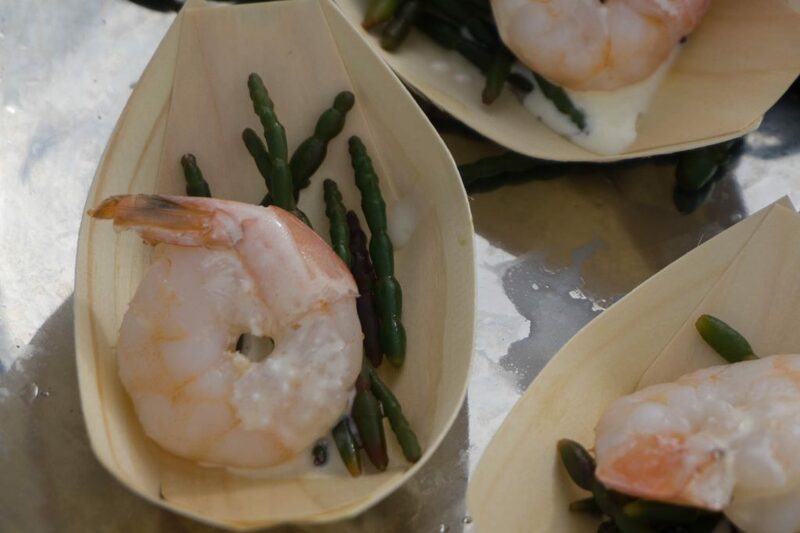 Richard’s sister Julie had prepared a snack with lightly blanched samphire and prawns, topped off with a choice from the Mount Zero range of salts blended with other spices including chilli, sea kelp, native pepper berry and Glenelg River herbs.